How the Rose City is taking on displacement and affordability challenges. Editor’s note: This article combines and adapts three articles by the Portland for Everyone coalition’s Michael Andersen. See the originals on this blog, and learn more about the group here. Portland’s approach shares similarities with the Seattle Housing Affordability and Livability Agenda recommendation to allow small duplexes and triplexes in single-family zones without letting property owners erect buildings larger than currently zoned. So, what’s in the Rose City’s innovative plan? First, let’s take a closer look at the city’s growing affordability problem. At $400,000, 59 percent of Portland households are excluded from homeownership. Many houses in these areas are now well over $400,000. Animated map by Mike Sellinger, used with permission. 2016 data is through August. Every month, Portland’s most beloved neighborhoods are moving further beyond the reach of typical homebuyers. Property tax records show the alarming spread, over the last four years, of homes valued at $400,000 or more—enough to make them unaffordable to 59 percent of Portlanders, according to the latest Census estimates. As the map above makes obvious, the wave of price increases isn’t simply tied to construction or demolition. It’s hitting new houses and old ones, in neighborhoods that are adding homes and in neighborhoods where adding homes isn’t allowed. Montevilla Portland remodel by Michael Andersen (used with permission). This house is 1,700 square feet on SE 75th Avenue in Montavilla. Last year, it sold for $247,500—a $1,200 monthly mortgage payment. After the really nice remodel you see here, it’s going for $549,000. Profitable for the flipper, but the only thing this project did for the city was replace one middle-class family with one rich one. But the really odd thing is that on this lot, replacing one middle-class family with one rich one is just about the only thing a landowner is legally allowed to do. When a city gets more desirable but isn’t allowed to add more places for people to sleep, this is what happens: the old homes don’t stay affordable. They just get priced up and up and up. It seems a little strange, but one of the things Portland needs to do as a city is to prevent that remodel and get more of the city’s capital invested in projects that prevent displacement rather than enable it. A typical Portland home vs the maximum single-family home size allowed under current Portland law. The city’s proposal is to change this. Rendering by Courtney Ferris (used with permission). A duplex plus AADU, totaling 2,500 square feet, a housing option that would available under the proposed Residential Infill Project. Rendering by Courtney Ferris (used with permission). Montevilla Portland remodel with listing by Michael Andersen (used with permission). Portlanders have already seen what that would look like, in more and more neighborhoods across the city. But it doesn’t have to be that way, and Portland has a smart plan to combat that trend. The single biggest effect of Portland’s residential infill project, according to an analysis released last month, is that new single-family homes would have to be much smaller (image from Residential Infill Report, Oct 2016, p. 6) by City of Portland. If there’s one thing virtually all Portlanders can agree on, it’s that homes should cost less than they do right now. There’s a lot of disagreement about how to do this. But if there’s a second thing that most Portlanders can agree on, it’s that McMansions are dumb. Knock down a 1920s cottage, build a 2010s behemoth: you just spent half-a-million dollars to replace one home with one home, and you basically paid for it by replacing a middle-class household with a rich one. The fact that so many people agree this is bad—affordability advocates, historic preservationists, immediate neighbors—is the key to the compromise behind Portland’s residential infill project. Greatly reducing the maximum size of new homes, which also reduces the number of demolition projects that turn out to be profitable (and therefore the number of demolitions that happen). Re-legalizing midblock duplexes, corner triplexes, and multiple accessory units, which means that when homes are replaced, the new ones will be cheaper and there will be more of them instead of being much larger and more expensive. The number of new homes built wouldn’t drop by much because the smaller number of homes that would be demolished would be replaced by multiple smaller, cheaper units—instead of freestanding McMansions. Portland residential infill-proposed housing forms (image from Residential Infill Report, Oct 2016, p. 15) by City of Portland. Today, McMansions are totally legal to build, but none of the homes above is. The city’s proposal would reverse this. Portland residential infill-proposed setbacks (image from Residential Infill Report, Oct 2016, p. 11) by City of Portland. Another proposal in the residential infill project would create more tree-lined streets in the future and preserve more on-street parking space. One-car driveways, after all, don’t really increase the number of parking spaces because each one eliminates a curbside space. 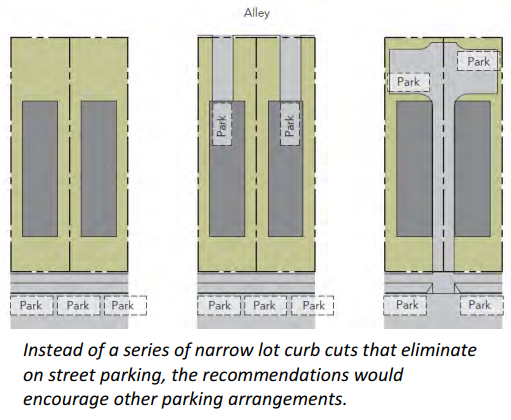 Portland residential infill-proposed parking efficiency (image from Residential Infill Report, Oct 2016, p. 21) by City of Portland. 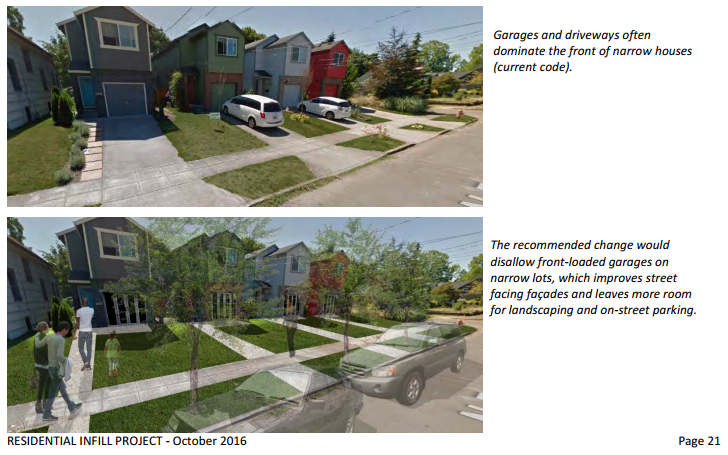 The city’s proposal is to maximize parking efficiency by legalizing alley-facing driveways and shared driveways leading behind the house. How much would prices of newly built homes go down? There are lots of things the city’s proposal does not accomplish. Newly built duplexes would be a lot cheaper than newly built McMansions—check out the price estimates in the green box below. Portland residential infill projected pricing estimates comparison by Johnson Economics. But $431,000 is not exactly cheap, even for a brand-new home. “You need a four-plex to get at least one of those units into the $100,000 to $150,000 range,” said Garlynn Woodsong, a northeast Portland neighborhood advocate who has developed a four-plex and a three-plex out of old buildings in his area. Danell Norby, who represents advocacy coalition Anti-Displacement PDX on the residential infill project, said the project doesn’t do as much as it could to increase the number of homes in Portland. Norby suggested expanding the focus area to include all of Portland’s residential land instead of the approximately two-thirds of it proposed by the city. Projected demolitions in Portland, OR, in next 20 years, without residential infill implementation, map by Johnson Economics. Johnson said that when he got the assignment from the city, he wasn’t sure what his model would turn up and wasn’t even sure what the city hoped his analysis would conclude. So, it’s clear that Portland faces serious affordability and displacement challenges, as discussed above. And Portlanders, in their plucky, problem-solving, community-minded way, are eager to find solutions together. Facing the spread of startlingly expensive housing across Portland, city officials are considering re-legalizing certain types of housing in many of its residential areas. A single-story triplex, totaling 2,500 square feet, a housing option that would available under the proposed Residential Infill Project. Rendering by Courtney Ferris (used with permission). The building on the right in the above image is what they’re talking about. And whether or not groups like DRU and UNR like it (or even know about it), there are lots of buildings like it scattered through Portland’s neighborhoods already. Notably, though, almost none of them is new, because in 1959 the city made it illegal to build any more triplexes in most Portland residential areas. A typical Portland home vs the maximum 6,750-sf single-family home size allowed under current Portland law. The city’s proposal is to reduce this allowable maximum to 2,500 sf. Rendering by Courtney Ferris (used with permission). To be fair, the 6,000-square-foot McPalace on the right is the largest that could possibly be built, not what is in fact currently being built. Last time the city checked (in 2013), most new homes on standard residential lots were between 2,500 and 4,000 square feet, and it’s unlikely that they’ve shrunk since. By comparison, the “typical Portland home” pictured on the left, hypothetically built in 1920, is 1,700 square feet (not counting that cool porch). The city’s most recent proposal is to cap all new buildings on standard residential lots at 2,500 square feet total. This would prevent the largest 60 percent of new single-family homes—the McMansions, in other words—from ever being built. A typical-sized Portland home versus the maximum allowable new single-family home (2,500 sf) to be allowed under the proposed Residential Infill Project. Rendering by Courtney Ferris (used with permission). Again, the economic study noted above concluded that this new maximum on the size of homes would reduce the number of demolitions in the city over the next 20 years. That’s because, with smaller maximum home sizes, demolitions would become less profitable. Mostly, this would happen by reducing the number of 1:1 demolitions (McMansions) and 1:2 demolitions (“skinny houses”). This seems to be the fear expressed by people like Davis or Midge Pierce of the Southeast Examiner (another vocal critic), and it’s understandable. But the key reason why this wouldn’t happen, according to the economic study, is the new cap on building size. If that formula isn’t true, then demolition won’t happen. By shrinking the size of new buildings, Portland would greatly reduce those buildings’ potential sale price and therefore the number of demolitions that are viable. The other difference is that when demolitions do occur, the city’s proposal would ensure that instead of replacing one small home with one huge home, they’d replace one small with two or three small homes—reducing displacement instead of enabling it. Unfortunately, simply reducing demolition wouldn’t do anything to help Portland’s affordability problem, which is one of the goals of the residential infill project. If all building in the city stopped tomorrow, it would only accelerate the process by which tens of thousands of little old bungalows are gradually becoming as expensive as McMansions. A duplex totaling 2,500 square feet (two 1,250-sf homes), a housing option that would available under the proposed Residential Infill Project. Rendering by Courtney Ferris (used with permission). An 1,800-sf duplex plus 700-sf DADU, totaling 2,500 square feet, a housing option that would available under the proposed Residential Infill Project. Rendering by Courtney Ferris (used with permission). Another idea that isn’t in the city’s latest proposal—but that could be—would be to make it legal to put a fourth unit on a lot, as long as at least one of the four is both affordable to lower-income households and accessible to people with disabilities. A four-plex totaling 2,500 square feet, inclusive of an affordable, accesible unit, a housing option not yet included under the proposed Residential Infill Project. Rendering by Courtney Ferris (used with permission). A four-plex totaling 2,500 square feet, inclusive of an affordable, accesible unit, a housing option not yet included under the proposed Residential Infill Project. Animated rendering by Courtney Ferris (used with permission). Of these options, only the last one—the four-plex with a cost-control requirement—would directly create a new home that’s affordable to lower-income Portlanders. Again, this isn’t part of the city’s latest proposal. They’d slow price increases citywide by creating additional homes that give middle-class people somewhere to move that doesn’t displace a person or family with lower income or wealth. They’d make it possible for more homes in Portland’s residential zones to be within reach of the city’s middle class. Most Portlanders would probably agree that both of these goals are good. But most Portlanders probably want people with lower incomes and wealth to benefit from housing policy changes, too. Portland for Everyone published a followup article that explores the Residential Infill Project’s potential for Portland households with lower incomes and wealth. Portland for Everyone supports abundant, diverse, affordable housing. Its blog, from which Sightline Institute gained permission to repost these articles, is a reported effort to explore the ways to achieve those goals. You can learn how to influence the residential infill project here. What Portland (and all cities, especially in Oregon) needs is to begin serious efforts to capture the socially created land-value by shifting taxes off of structures and onto land, which will create the incentives necessary to raise housing stock incrementally everywhere, rather than trying to do baroque planner-driven rule sets. Many excellent resources, including videos, discussing why land value taxes are the way to address the pricing boom driving people out of cities. Thanks, John Gear. Your suggestion is a wise one. Unfortunately, I don’t think most of Portland is listening, and even those who are likely haven’t considered that Henry George’s land tax could be a very effective land-use policy. Probably because our relative success in containing suburban sprawl, we’re much more comfortable fighting about land use planning and arcane zoning rules than exploring fresh ideas like using tax policy and market signals to guide land local use. I like the proposal outlined in the above article, but I also hope your post, John, prompts people to check out your link– and the idea of shifting urban property taxes away from buildings to toward land. It’s long past the time that we should have started that conversation. Hey John, I disagree with your use of “the way” (one of many, I’d say!) but I for one am very much in favor of shifting to a land tax! It’d require a popular vote in Oregon to amend the constitution, right? I believe it would require a constitutional amendment, but that it would be well worth it for a host of benefits — anti-sprawl, more affordability, more social equity, fiscal responsibility, and improved tax stability, all without disincentives to investment in the urban area where services are already at hand. Those interested in this post might want to check out StrongTowns.org, especially the recent series of essays by Chuck Marohn that he wrote after his Oregon tour the first week of October. You can check out the video of his presentation in Salem on the website, and he discussed Portland and affordability. I did not mean to say that land-value taxes are the _only_ possible solution, but they are the most powerful and elegant, with the fewest unintended consequences. I have questions I can’t seem to find answers to. Can you help? Does this plan have any provision for increasing/legalizing the conversion of existing, vintage homes into duplexes/triplexes, etc.? Also, does it mandate any deconstruction and salvage when vintage homes are demolished? Does it put in place any greater restrictions or safety measures for hazardous materials release during demolitions? – Yes, this plan could also re-legalize internal conversions. This is one of its anti-demolition measures and also one of the potentially cheaper ways to add new small homes. I say “could” because this has been discussed but the plan is still very much in play and some people don’t want new units of any kind. If you support this component of it, please consider letting Portland City Council know: [email protected]. Thanks for your replies. Much appreciated. I have one last, rather blunt question: Does PFE or Sightline accept money from large, pro-demolition developers like Vic Remmers/Everett, Randy Sebastian/Renaissance, Peter Kuysk/Firenze, etc. I promise I’m not trolling, I genuinely want to know and understand who is backing what. Hey Fred, no problem, skepticism is always healthy! I can tell you that I don’t have any financial interest in this myself other than a $5600/year freelance writing gig and an interest in my friends and maybe eventually my son being able to continue to live in Portland. I’ve got full editorial independence. So if you think I’d be willing to say things for that price that I don’t believe, then I guess you should doubt what’s written above. “Thanks to Vic Remmers and 1000 Friends for being so forward thinking.” (Nov 2 post). Eli Spevak, another developer, is also an acknowledged supporter. The problem with the proposal in this article is that replacing an existing small house with a new-construction house, duplex, or triplex will INCREASE the cost of housing, not decrease it. Minimum selling price: $1,224,000 ($612,000 per unit). Whose definition of “affordable” does that meet? All you’ve done is replace a $400,000 house with $612,000 units in a duplex. As well as commit the environmental waste of throwing away an existing house. Note that $200/sq ft is a very low construction cost in the current market, so the duplex will be very cheaply built. And 20% is pretty thin, implies developer margin only about 10%, few will accept that little. Developer maximize profits, they don’t sell for the “minimum”, they sell for the maximum the market will bear. There’s really no way to get around these economic realities. Assume you find an uninhabitable house that you can buy for land value alone. Even in a more affordable area like North Portland, land value for an R5 lot is around $170,000. Plug that into the calculation above and you still get minimum selling price $924,000 ($462,000 per unit). In reality the developer who finds this lot will still sell for the maximum market price, and simply make a bigger profit. Wishes and hopes can’t change the basic economics. New construction of duplexes and triplexes will not and cannot produce affordable housing, because the underlying land is too expensive and construction cost is too high. The only way for new construction to produce affordable housing is with multi-story apartment/condo buildings, because many more units can be stacked onto the lot (4 to 6 floors) and because of construction efficiencies (many units share same foundation, exterior, utility connection, roof, etc). Portland’s “affordable” (if defined as <$400,000/unit) housing future lies in apartments and condos on corridors developed with ample non-car transportation (MAX, streetcar, bus rapid transit, bike lanes, bikeshare) and retail. We're seeing this development on SE Division, on N Williams, now starting on NE Sandy. We are also starting to see it around Gateway/82nd and points east, along the MAX line. We are also starting to see it in St Johns, and many other corridors on the east side. The proposal that you've written about, the so-called "residential infill proposal" (RIP), is only going to eliminate the small and borderline affordable houses left in Portland and replace them with expensive luxury housing. Developers will get rich. Young families looking for small houses will lose out. By the way, please note that RIP was carefully written to exclude Eastmoreland (where mayor Hales lives), most of the Southwest hills (where most of city council lives), most of West portland (Forest Heights, etc). This was done for political reasons. It also excludes most of Portland east of 82nd, partly for political reasons and partly because developers see little market for $600,000 to $800,000 luxury housing there. John, nice to see your name here. I always appreciate your bringing the math. If we stick with the status quo, we’ll see more of the status quo: every house will keep climbing in price because of the general housing shortage, plus the cheapest and ricketyest houses in the most desirable areas will be demolished in favor of huge houses, plus the city’s remaining vacant lots will gradually fill up with huge houses. The proposal described here addresses all of these: it slightly increases the housing capacity of residential areas, reduces demolition of the cheapest houses (by lowering FAR and thus lowering underlying land value) and in the (quite rare) event of an R5 demolition, building two $400,000 homes rather than one $750,000 home. Unless I’m missing something. What am I missing? By the way, on your last point: Portland for Everyone, at least, has been a consistent voice for making this apply citywide. I think we have successfully been part of a coalition to at least include Eastmoreland and Irvington in the affected area, contrary to what you see in the heat maps above. Michael, you said “no end user is going to pay $612,000 for a 1,250-square-foot home, which is the maximum size allowed for half of a duplex under this proposal. Instead of the scenario you describe, what will happen is that would-be demolishers will be outbid when they try to go after that house — they’ll never pay more than $200,000 for a lot. So the little houses will remain standing”. The way Portland prices are going, I’m not so sure (that people won’t pay that much). But even if you are right, then the proposal you are advocating makes no sense since, per what you just said, no-one will buy the proposed units and thus they won’t be built. This also shows why the RIPSAC is now backing away from the limit on infill structure size that they initially proposed. The developers realize that to make these developments most profitable, they need to be really big, like 5,000 sq ft structures on a 5,000 sq ft lot. McMansions with two 2,500 sq ft duplexes, basically. Yes, I support building ADUs, I’m trying to build one in my basement for my 80 y/o father. Converting existing houses to duplexes is another good option which may be economically viable and is more environmentally sound. If the proposal includes Irvington and Eastmoreland, I wonder why is most of Portland east of 82nd excluded. Land is less expensive there so this proposal has a chance to work, and the city is (supposedly) trying to encourage another commercial center at Gateway, where there is MAX, freeway, and room. Also why is most of the west side excluded? Are Barbur and West Burnside not “corridors”, why shouldn’t infill extend to Forest Heights and the SW Hills? It seems more like politics. Eastmoreland was excluded because Hales was mayor and he lives there; now that he’s a lame duck, Eastmoreland is included. If most of the city council didn’t live in the SW area, that area would have been included too. Okay, back to the main question: how to get more affordable housing in Portland? The first thing is to build more infill housing of the kind that actually can be affordable: many-story apartment/condo buildings on commercial center and streets. The second is to make the permitting process for those buildings faster and more efficient: which is not the same as slashing system fees, because infrastructure needs to be built to support housing growth. The third is to spread Portland’s growth to East Portland, rather than keep cramming everyone into the close-in city. The fourth is to increase income so that the affordability level keeps pace with housing demand/prices: we need to raise the minimum wage for a start. Fifth is to improve our education system: better educated people have the chance to earn more. The residential infill project (RIP) is a developers’ scheme to build luxury infill housing, not a route to affordable housing. I agree, given the size constraint, demolition + duplex is probably not going to happen very much in Portland unless the housing market goes further toward coastal California, in which case the little old homes being protected are no longer cheap either. Less demolition is probably not a developer’s ideal situation but it’s fine with me personally. It seems like duplexification or internal division of an existing structure is where the new residential infill supply would come from for the forseeable future. If you agree that those are less objectionable, then great. Of course the exempted area is ultimately about politics. If you want this policy to be more widespread, seems to me you should advocate for it being citywide, not for it to be nowhere! I agree with all of your other prescriptions for affordability, except for the notion that Portland is “cramming” people into the central neighborhoods. Portland is not a dense city; our crowding problem is about cars, not people. None of those measures are mutually exclusive with the residential infill project, though. At some point a city needs to decide whether it likes the quality of life that has existed and whether it wants to keep that or move to something different which can be done with zoning. If the only profitable way to rebuild is with mid-rise and high-rise then in time (perhaps decades) nice quite streets with smaller homes will end up being parking & traffic disasters all shaded from the sun by massive structures. The reality of this problem is regulated growth which by the very nature of supply & demand causes home prices to go up. Big cities have a problem because the cost of true operation (for most) is beyond their existing revenue collection stream which means things start to fall apart. So, the more people that can be brought into the city, the more this tax & spend scenario can continue which is the real reason for limiting growth in the burbs. A self-serving plan that is destined to fail. Problem with the proposal is that it masquerades as a fix for McMansions and yet only “limits” them to 4,375 square feet–as city planners have noted, hardly anyone builds bigger than that (could it be the writers of this proposal are same as the developer-funded supporters of it, i.e., PFE etc.?). All the current oversize manses popping up in Portland would be unaffected, so the proposal keeps business as usual while also offering up miles of well-built, affordable and unique housing to the developers’ maw. City Council will take comment until Nov. 23 and needs to hear from people with their boots on the ground and a stake in how this city grows. In this green city, we’ve long embraced sustainable values of reduce/reuse/recycle; we haven’t embraced the idea of disposable housing that’s the assumption and consequence of this proposal. Margaret, where are you getting this 4,375 square foot limit? For R5 the maximum floor ratio proposed is 50 percent, so 2,500 square feet for a standard 5,000 square foot lot. The size caps are lower for R7. Thanks for the reply offline, Margaret. I’ll summarize briefly here: she’s referring to the fact that under the city’s most recent proposal, low attics and basements don’t count toward the 2,500 square foot cap. Fair point! The code separately limits houses to 2.5 stories and 30 feet as measured from the lowest point surrounding the house … so if you had a low attic and a basement the latter would need to be fully underground, which is pretty rare and expensive around here. But low attics would indeed add some more value to newly built homes (I’m not sure how much) so I’d agree that’s worth thinking about as we consider how many 1:1 demolitions would be deterred here. Removing or changing this exemption might be one way to tweak this proposal a little bit away from demolition and new construction. I would like the definition of a McMansion. I’m sure we all have different ideas of what one is. As far as the direction the city has taken by back handedly changing the definition of zoning 15 years ago, I am wary of any more changes. Its bad enough in my opinion that R-5 use to mean 5,000sf lot. Now it means 3,000sf minimum and 2,500sf minimum on corner lots. This higher density on corner lots has ruined what I considered classic neighborhoods around Wilshire, Beumont and Alameda. I am very weary of any changes that allow even higher densities. I don’t like it and I don’t trust the City of Portland to be a good steward to the land. What’s your definition of McMansion, Thad? When developers say approaches that reduce their profits won’t work, one must look past the posturing. This Thanksgiving weekend, a project in my neighborhood had crews working on it every day except Thursday. These workers were paid overtime. If developers were struggling under land-use restrictions, no one would have worked Friday, Saturday, or Sunday. Any time a home can be flipped for a $300,000 price gain with no change in square footage, as the one described in this article, there’s lots of profit involved. As Alan Durning pointed out in his excellent essays 4 through 8 in this series, extra rooms in large houses can be used to house more people with lower incomes. So prohibiting large houses from being built just reduces the potential supply of affordable housing. If anything, to address the housing crisis the city should encourage larger houses to be built and then make it easier for more people to live in them. Also, let’s not use the pejorative term “McMansions” for all large new houses. That falsely suggests that any such house must be a tasteless blight on its neighborhood. But a large house doesn’t have to look like Tony Soprano’s house. Plenty of large new homes are beautiful, often more so than the run-down properties they replace. Durning and Porter make excellent points about the value of larger homes (assuming they can be designed to fit in with the character of the neighborhood where they are being built. At Berkeley many years ago I shared a house with five other students, each of us have our own room, typically with a small sink and shared bathroom down the hall and a shared kitchen, dinning room and front living room. This was clearly affordable housing. Not everyone has to have their own kitchen, bathroom, or dinning area to have a livable habitat. Also, keep in mind that most zoning codes allow up to nine unrelated people to occupy a single-family home. It is very common in Asia, for example, to see extended families sharing the same larger home, often over multiple generations. Also, larger single-family homes can later be subdivided into duplexes or triplexes in the future as the original occupants become empty nesters and need less space for themselves. If we make it easier for homeowners to rent out rooms in existing larger older (or even new) dwellings the housing shortage for many singles and childless couples will be lessened. Your arguments appear to be predicated on home ownership at a time when the market is shifting (or has shifted?) in favor of rentals.